PRAIRIE VIEW, TX – Approximately 23 small farm beef cattle producers from Waller, Washington and Fort Bend counties attended a Beef Cattle Palpation Clinic held on the campus of Prairie View A&M University on April 29 – 30. The clinic is one in a series of workshops that will be held in 2011 through Prairie View A&M Cooperative Extension Program’s Tri-County Beef Cattle Series. Cooperative Extension Agriculture & Natural Resources agents, Kelvin Neal, Kenneth McCullough and Major Stevenson, Jr. implemented the Tri-County Beef Cattle Series in 2010 to help primarily limited resource producers improve their beef cattle and farm operations. 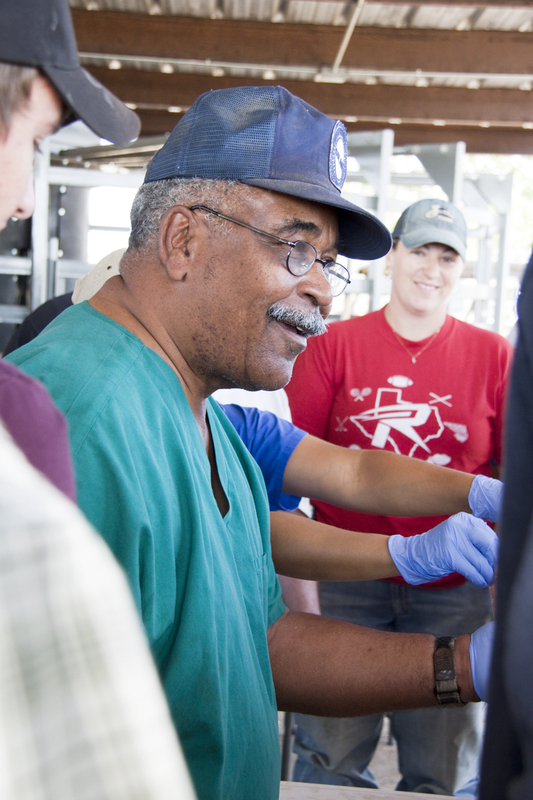 Dr. Wendell C. Baker, DVM, Baker Veterinary Clinic in Prairie View, Texas, facilitated the clinic. Dr. Baker gave detailed information on management tools to use to determine pregnancy in cattle, practices to improve reproduction in the herd, culling decisions that need to be made and necessary equipment to use. Dr. Baker also took the producers through the cows’ reproductive cycle and gave them hands-on experience in palpation techniques to help them determine the stages of pregnancy in their herd. Dr. Wendell C. Baker, facilitator of the Beef Cattle Palpation Clinic, explains the management tools to use to determine pregnancy in cattle. 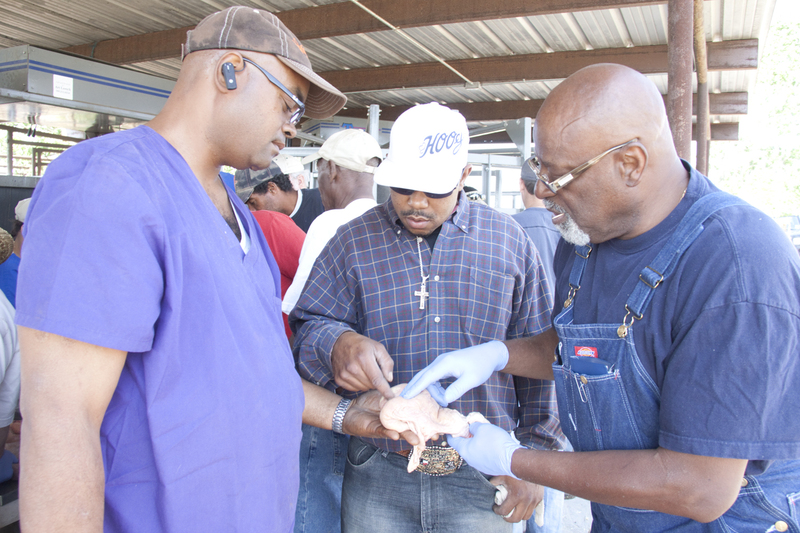 Cooperative Extension agriculture agents Major Stevenson, Jr., left, and Kenneth McCullough, center, watch as beef cattle producer, Fred Thomas III, gets hands-on experience at the Palpation Clinic. Cooperative Extension agents Neal, McCullough and Stevenson are planning future workshops and clinics for small farm producers and ranchers. For a schedule of upcoming Tri-County Beef Cattle Series events contact them at: Neal – 979/277-6212, kwneal@ag.tamu.edu – Washington County; Stevenson – 281/342-3034, mwstevenson@ag.tamu.edu – Fort Bend County; and McCullough – 979/826-7651 – kwmccullough@ag.tamu.edu – Waller County. This entry was posted on Tuesday, May 10th, 2011 at 3:20 pm and is filed under Agriculture and Natural Resources, General CEP News. You can follow any responses to this entry through the RSS 2.0 feed. You can leave a response, or trackback from your own site.